The traditions associated with the Lunar New Year are full of auspicious meanings. Ringing in the new year, also known as Chinese New Year or the spring festival, usually means following a set of customs passed down over generations in hopes of welcoming health, wealth, and good relationships over the coming year. There are specific rituals for the days leading up to the holiday—for the year of the dog in 2018, the new year starts on Feb. 16—and over the course of the spring festival. Here’s your day-by-day guide for what you should do each day of the Lunar New Year. The 28th day of the last month on the lunar calendar—two days before the Lunar New Year—is designated the day of cleaning. The act of cleaning is in many ways symbolic. By sweeping dust and discarding things that aren’t needed anymore, Chinese people are in essence saying farewell to the old year. But it’s also important to get the cleaning done before the new year because it’s believed the acts of sweeping, washing, and mopping—especially during the first five days of the spring festival—will drive one’s good fortune away. The first day of the new year is spent visiting family (traditionally, the husband’s side) and friends. Married couples will hand out lai si, red envelopes with money, to children, unmarried people, and the elderly to wish them the best for a new year. Some people also give red envelopes to doormen, waiters, drivers, and other service workers. Despite the busy visiting schedule, one shouldn’t rush others by forcing them to wake up early in the morning because it’s believed that will set a tone for the rest of the year—making them feel they’re pushed by external forces rather than taking action for themselves. It’s also important to avoid killing animals on this day as that’s believed to bring bad luck. Killing a chicken, in particular, is believed to kill one’s luck (link in Chinese) since chicken is a homophone for luck in Mandarin (ji) and Cantonese (gai), so it’s best to avoid freshly slaughtered chicken on the first day. The second day of the Lunar New Year is when married couples visit the wife’s family, but the specific practices vary by region. For example, in the Chaoshan area of Guangdong province, couples will visit with gifts, such as candies and cookies, and have lunch with the wife’s family before getting dinner with the husband’s family. In the city of Heze in the Shandong province, it’s tradition for newlywed couples to bring the wife’s parents an even number of presents (link in Chinese)—believing good things come in even numbers—in addition to a gift box filled with several layers of buns and desserts. Likewise, it’s tradition for the parents to decline the gift box. During the first two days of the new year, people are paying visits and their respects to friends and family. The third day, however, is designated a day for staying home, the idea being that you should avoid visiting others to avoid any possible arguments. 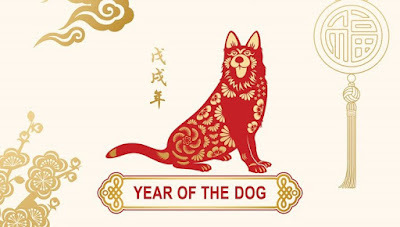 This day is also known as the day of the angry dog—chi gou ri (赤狗日)—a god believed to bring misfortunes (link in Chinese) in ancient times. Furthermore, going out on this day is believed to bring poverty because the Chinese word chi also means deficit. This is believed to be the day when several gods associated with cooking and wealth return to earth from heaven. It’s an especially important day for entrepreneurs, who hope to win favor (link in Chinese) with the gods. Starting in the late afternoon, people prepare fruits, alcohol, and three types of meat—fish, pork, and chicken—in addition to lighting incense. The fifth day of the new year is said to be the birthday of the god of wealth. To welcome the god, people will light fireworks and open doors and windows shortly after midnight. In the past, people also carried the traditional practice of eating all night with the hope (link in Chinese) the god of wealth will bring fortunes to their families in the coming year. There are two key ingredients (link in Chinese) to welcome the god of wealth: goat’s head and carp. The former is an auspicious symbol while the latter in Chinese, yu, sounds like the word for leftovers, a symbol of being well off. Whereas people are strongly discouraged from cleaning during the first days of the new year, the sixth day is when they should throw away old clothes, take out their trash, and clean their homes to send away the ghost of poverty. The story goes that a son of an emperor in ancient China turned into the ghost of poverty. The son was short and weak, and often in ragged clothes. He got the name “the man of poverty” because he would tear apart the clothes people sent him before wearing them, according to the folklore (link in Chinese), before eventually becoming the ghost of poverty. The seventh day of the new year marks the creation of human beings by Nuwa, the mother goddess who separated heaven from earth in Chinese mythology. When creating the world, Nuwa spent six days (link in Chinese) to create six animals—chicken, dog, pig, goat, cattle, and horse—before finally creating humankind. Therefore, the day is also known as ren ri (人日), the day of humans. It’s believed that a sunny ren ri will bring good luck and peace. Celebrations like making human-shaped paper cuttings, hiking, and composing poems date back to China’s Han dynasty. In the southwestern city of Chengdu, locals often visit (link in Chinese) the former residence of Du Fu, one of China’s most famous poets from the Tang dynasty. In China’s southern Chaoshan region, people prepare soup with seven vegetables (link in Chinese), including Chinese kale, garlic chive, and celery, to fight off diseases and avoid bad luck. In Malaysia, which also celebrates the Lunar New Year widely, people will eat a dish known as yee sang, consisting of raw fish slices, vegetables, lime, pickled ginger, and crunchy toppings such taro strips (video). Tossing the mixed ingredients represents a wish for a prosperous year—the higher the toss, the better. In China, work usually restarts after a seven-day break, but there’s an important celebration on the 15th day to mark the end of the new year: the lantern festival. On this day, people will light lanterns, which are also used in a popular festival game. A tradition dating back to China’s Song dynasty, people will paste riddles, usually in the form of poems, on their lanterns. Those who can solve the lantern riddles can claim prizes from the owners. Today, some places light up the lantern festivals in a more modern way. For the 2017 lantern festival, Guangzhou set off 1,000 drones to display the Chinese character 福, which means blessings, in the sky. The spirit of the lantern festival is to get together, and it’s also a good time to appreciate the full moon—which occurs on the 15th day of each month on the lunar calendar—a symbol of reunion and happiness. People also eat glutinous rice balls with various fillings such as bean paste and sesame to celebrate the festival.